Situated 30 miles from Faridkot, Muktsar in Punjab commemorates the martyrdom of 40 Sikh soldiers three centuries ago. At Gurudwara Shahidganj Sahib Guru Gobind Singh conducted the last rites of the ‘Chaali mukte’ – or the forty redeemed in Muktsar. It’s an edifice that symbolizes the bravery and honor of the Sikhs. Among the four historical gurudwaras in Muktsar town, Gurudwara Shahid Ganj marks the spot where the Guru conducted the last rites of the Chaali Mukte. “When Guru Gobind Singh Ji came here, he himself performed the last rites of the 40 Sikhs who laid down their lives in the battle. Guru Gobind Singh gave ‘mukti’ or liberation from material existence to the 40 martyrs. Many saints fail to get ‘Mukti’ even after years of hardship and difficulties. The Guru sent out the message that any sacrifice for the Guru and for religion would help a person get liberation from material existence,” said Bhai Harpreet Singh, the head priest of Gurudwara Shahid Ganj Sahib. Located at Muktsar, it’s an important pilgrim center which derives its name from ‘Challi Muktas’ or, the forty redeemed who sacrificed their lives here fighting against the Mughals on December 29, 1705. When the 10th Sikh leader Guru Gobind Singh learnt about their supreme sacrifice, he kissed all the dead and the dying and called then the Chaali Muktas or the Forty Liberated Ones. He renamed Khidrana pond, the site of the battle, as Muktsar or the pool of salvation. 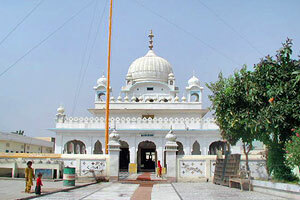 A large number of devotees come here regularly to pay homage to the martyrs at Gurudwara Sahidganj. The local residents come twice a day to the holy spot and recite their Japji sahib. The holy place is believed to have supernatural powers that enable the pure hearted devotees’ wishes come true. “It is important to let our future generations know about our rich heritage. We must also make them aware of the sacrifices made by our Gurus,” said Sukhdev Singh, a devotee. “All our wishes are fulfilled. We visit the gurudwara twice a day in the morning and the evening. It provides inner peace and tranquility and our wishes are fulfilled,” said Rajwant Kaur, a devotee. There are three more holy shrines in Muktsar commemorating Guru Gobind Singh’s fight against Mughals. Gurudwara Tambu Sahib marks spot where the muktas took position behind trees and shrubs, which they camouflaged to look like tents. Gurudwara Tibbi Sahib is the mound or tibbi from where Guru Gobind Singh shot his arrows at the Mughals. Darbar Sahib is the principal shrine at Muktsar, which was originally constructed in 1743, but the present building is from the 1980s. In January, millions of devotees gather in Muktsar to pay homage to the martyrs.